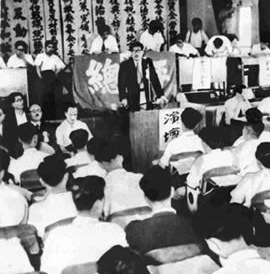 A speaker addresses members at the inagural meeting of Sōhyō. The General Council of Trade Unions (Sōhyō) was formed in 1950 with strong backing from the Japan Socialist Party. It was intended as an alternative to the Sanbetsu union federation, which was affiliated with the Japan Communist Party. The JCP was the target of the Occupation's Red Purge in 1950, and many of its top union leaders were purged from their positions. Sōhyō grew rapidly to become the largest union federation in Japan. Over time, Sōhyō came to represent many public sector workers who were not permitted to strike. However, Sōhyō also initiated and organized the annual Spring Labor Offensive, or Shuntō, in which private sector unions in particular industries coordinated brief strikes to provide a dramatic start to annual wage negotiations. Sōhyō was formally dissolved in 1989 with the formation of Rengō, which its member unions joined.